Michael Heizer’s Levitated Mass has started it’s journey on Tuesday, Feb 28th at 11pm, and it will arrive at LACMA ‘(very) early in the morning on Saturday, March 10.’ More on twitter: @LACMARock. I’ll be updating this post and tracking the move. LACMA’s Gawker Guide has details for viewing the rock as it moves along the streets of Los Angeles. LATimes slideshow, and on flickr. …at Chino Avenue, just east of Chino Hills Parkway in Diamond Bar around 4 a.m. Thursday (March 1) and stay there the entire day, according to museum and city officials. It will resume in a westerly direction into Rowland Heights Thursday night and into Friday, where a stopover is planned at Buttonwood Lane and Pathfinder Road for the third and fourth day of the journey, Friday and Saturday, according to the museum. Originally on Infrascape Design here. Via Zev. Official LACMA news of the move here. Several articles have been gnawing at my subconscious this winter that illustrate the environmental trade-offs needed to move beyond carbon. First up, the NYTimes reported on the failure of IPCC conference in Durban to result in a new green house gas treaty after 17 such annual conferences. But maybe the task is too tall. The issues on the table are far broader than atmospheric carbon levels or forestry practices or how to devise a fund to compensate those most affected by global warming. Effectively addressing climate change will require over the coming decades a fundamental remaking of energy production, transportation and agriculture around the world — the sinews of modern life. It is simply too big a job for those who have gathered for these talks under the 1992 United Nations treaty that began this grinding process. So a different approach is needed then a top-down political process. The solution perhaps is a mix of market driven solutions, local governmental action, and grass-roots individual actions such as those promoted by the Transition Town movement. The market based solutions are the next round of articles that I want to share. 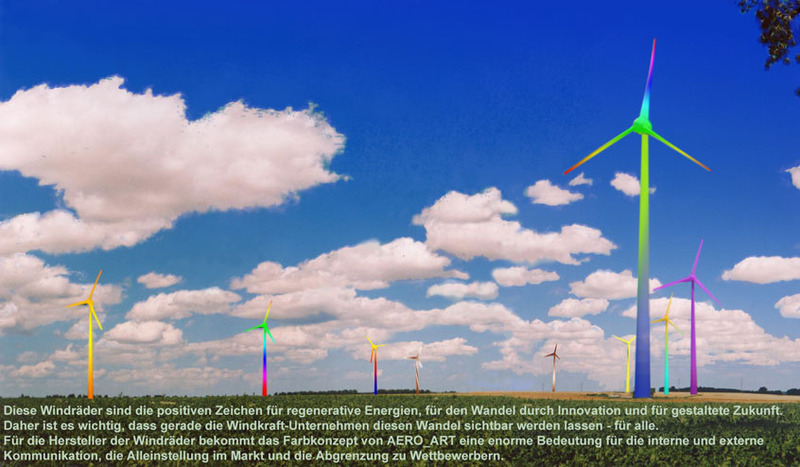 Horst Glaesker paints wind turbines. 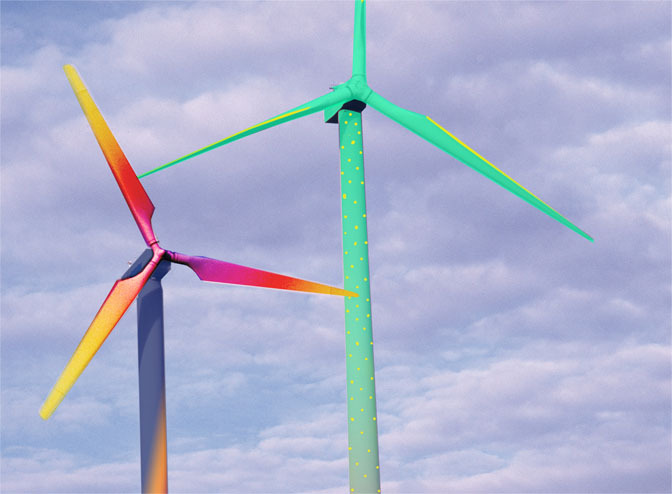 Not pictures of wind turbines, but entire 100m tall turbines in psychedelic colors that are more akin to dazzle camouflage than to art. Gotta admit, I’m pretty skeptical about ‘aero-art‘ actually being art (even when subscribing to the definition of art being whatever somebody calls art). Maybe it’s just a case of cultural mistranslation of Glaesker’s Tutonic style. But these color schemes and geographic patterns won’t win any over any opponents to wind development. I would also hazard to guess that the paint job won’t prevent any bird strikes either. The latest utility scale wind power potential map from the NREL is available with detailed maps for each state now at 2.5 x 2.5 km resolution – a significant improvement from prior editions. There are also community scale wind maps and offshore wind maps too. The NYtimes explores the paths that Paolo Soleri’s masterpiece may take now that he has retired. 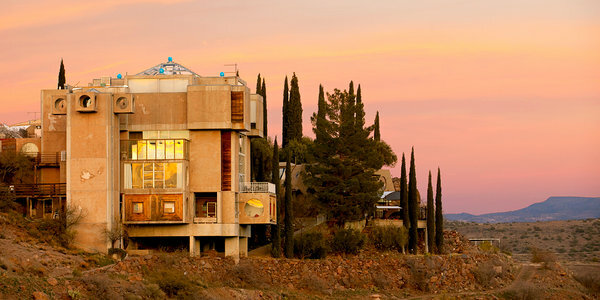 Will Arcosanti become a stagnant museum like Taliesin West, a vibrant educational foundation that furthers his work and philosophy, or will it slowly crumble back into the desert? Intended to be a self-sufficient an Eco-City, Arcosanti lacks the basic systems that are standard sustainability practices today (and even were typical 40 years ago), no insulation, no water harvesting or recycling, just two greenhouses to grow their own food, no renewable energy systems, and high performance window. I’d even argue that the choice of concrete is not the most sustainable material to have used – yes, it has great thermal mass that is important in the desert, but has a huge carbon footprint. Perhaps history will see Solari as a visionary that lacked the technical depth (or knowledge) to fully realize his dreams (a charge that his peers like Malcolm Wells avoid), just a paper architect who built full-scale models. At least the Arconauts have their bells. The NYtimes has a slideshow here. Patrick Marold is an artist exploring the intersection between natural phenomina, energy, and perception – aka renewable energy art. 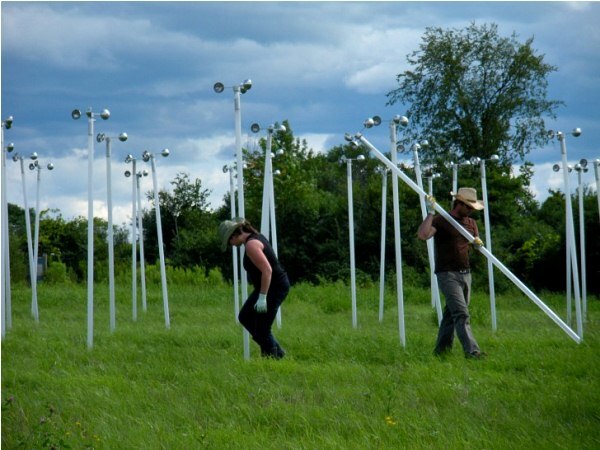 His Windmill Project in Vail, Burlington Vermont, and Iceland, plants posts with anemometers connected to LED downlights to illuminate the wind rustling across the site. 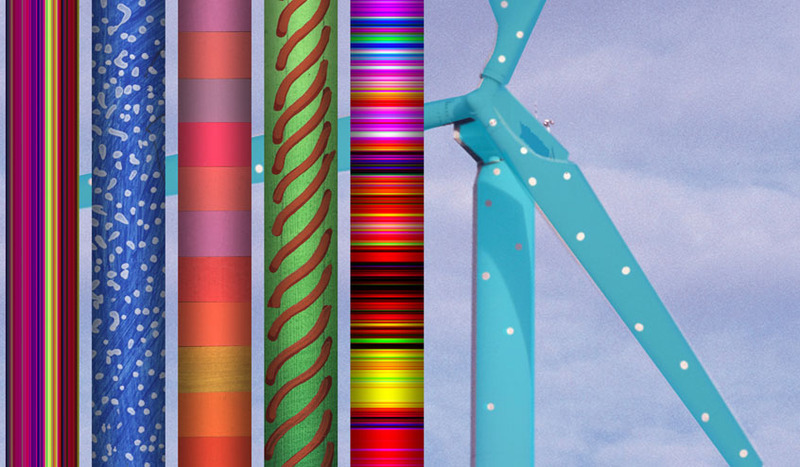 The Windmill Project from Patrick Marold on Vimeo. The WINDMILL PROJECT was developed out my desire to map and watch the wind, harnessing its behaviors. While living in Iceland during the long winter nights, I would install this sculptural tool in the pasture and hills. Iceland’s abundance of wind and dark hours provided the perfect setting to develop this idea. The most recent Windmill installation in Burlington, Vermont lasted 14 weeks last fall; and the 2007 installation in Vail, Colorado employed as many as 2700 windmills, covering over 15,000 square feet. 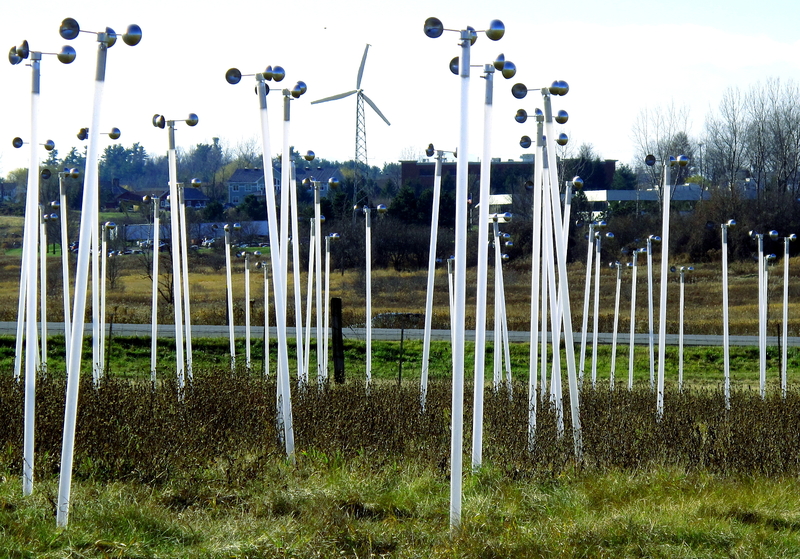 For nearly 2 months, these windmills translated the valley’s winds into blooming and breathing bodies of light. The WINDMILL PROJECT involves placing a mass of light generating windmills in specific outdoor locations. 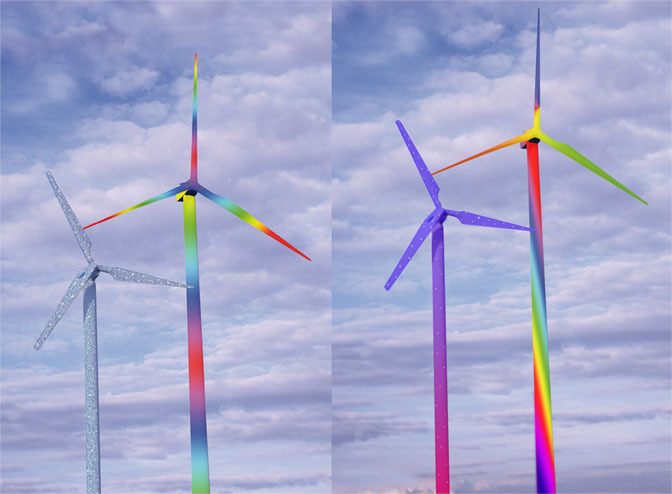 The wind forces each windmill to produce a relevant amount of light, in a sense digitizing the wind. This work of art converts the energy of wind into a responsive visual choreography, exhibiting the rhythm of a mechanical process that is collaborating with the harmony and chaos of wind. When there are gentle breezes that pass over the windmills, a dim glow appears, while strong gusts create bright pulsing waves of light. This sculpture momentarily embraces the wind allowing for a more attainable vision of this natural element, systematically creating a slight delay in the viewers’ sense of time. Some people have compared the visual representation to that of a flock of birds collectively swarming in the sky, or the uniquely animate northern lights. The impressive living body of light provokes a deeper perspective of the wind as it passes by. Holly Solar Products + Suntronics (Petaluma, CA) helped fabricate the lights and turbines. One of my favorite landscape photographers, Toshio Shibata has long focused (pun intended) on the infrastructure around Japan. I employ a particular kind of sensitivity for approaching landscapes and sceneries like still lives. It’s in way as if I was placing them right in the palm of may hand for examination. That’s why I never included the sky. Showing the sky would mean going back to depicting landscapes. Shibata was interviewed at EYEcurious in 2009.